Facebook has recently started testing a new feature for some users that lets them promote their posts to their friends by paying a small amount. This test, which was initially rolled out in May to some users in New Zealand, is now being rolled out to users in other countries. How Does Facebook Promoted Posts Work? If you are a part of the test group for Facebook Promoted Posts, you’ll see a “Promote” button next to the Like and Comment button on your post. To Promote a post, click on the Promote button. You’ll be shown the amount you’ll be charged and the payment mode that will be used. You can change the payment mode if you so desire. There are several payment modes that can be used, as shown below. Note that if you have added advertising coupons to your ads account, you cannot use them to promote your personal posts. This is probably to keep the ads and personal account separate. Once promoted, the post will be bumped higher in your friends’ newsfeed and will be labeled ‘Sponsored’. How Is The Price Decided? It seems that Facebook is testing out different prices in different regions to figure out how much a person would be willing to pay for Facebook Promoted Posts feature. As reported in few blogs, some users in Europe were prompted to pay EUR 3.09, while those in North America could boost their post for $6.30. For me and my friends in India, the price was set to $0.30. So, it is safe to assume that the price is not dependent on the number of friends a user has but is dependent on the region. But wasn’t Facebook supposed to be free? Rest assured, Facebook is and will always be free. Facebook Promoted Posts only ensures that your friends do not miss out on an important update from you. 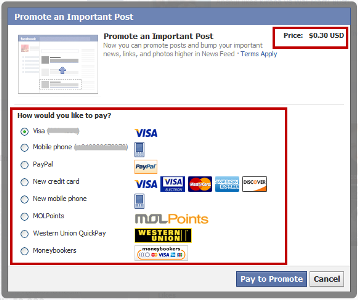 You can still post on Facebook without paying anything for it, and it will be shown to your friends just the way it was shown earlier. However, you must understand that due to the dynamic nature of news feed, the average news feed story from a user profile reaches just 12 percent of their friends, as explained by Facebook during Facebook Marketing Conference (FMC) in February this year (read this article on Techcrunch for details). For e.g., if I have 1000 friends on Facebook, it is illogical to expect that when I log in to Facebook I’ll be able to see updates from all 1000 friends. But with the help of this feature, I can now ensure that if I have something important to say, it is bumped higher in my friends’ newsfeed, thereby increasing the chance of it being noticed. In my opinion, this is a good-to-have feature. If I want to inform my friends of my new phone number, instead of sending an sms to everyone, I can just post it on Facebook and promote it. I wouldn’t mind spending Rs 20-30 for that. In fact, if I were to send sms, I would have spent more than that! Yes, there are sms cards, but even they come for a price, and don’t forget the hassle of sending messages to so many people! The only thing missing here is that Facebook doesn’t provide any metrics around the number of people who saw the posts. I would like to see a breakdown of organic and paid impressions of my post. Since this feature is still in test phase, we can expect these little modifications to be rolled out in the next iteration. 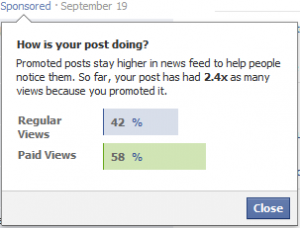 Update (Oct 12, 2012): Facebook now provides a percentage breakdown of regular views and paid views, as shown in the screenshot below. There are also some downsides attached to this feature. It could result in a lot of spam posts by affiliates, lead generators etc. But to counter this point, if you know that someone is a spammer, why would you friend them? And if you do, it means you don’t mind their spam posts! Still, it would be interesting to see how Facebook checks the potential abuse of this feature. What do you think of this new feature? Will you be using it? Disclaimer: I was am an employee of Facebook, but I am no longer associated with it. This is not a promotional post. The article is written based on my understanding and the opinions expressed are entirely mine. I bear complete responsibility for anything incorrectly mentioned. Even I’ve had a glimpse of the new feature couple of hours back, but until reading this post I felt its another money making gimmick by FB. 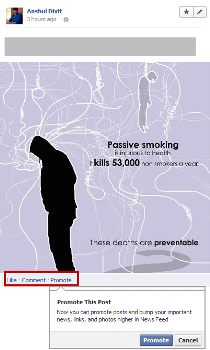 Just now I realized, how useful and economical it would be to communicate an important message with all FB friends.